Hotel security is a hot topic in the hospitality industry. Over the past decade, hotels have been targeted by global terrorist organizations with increasing frequency. Cybercrime has emerged as a serious threat to major chains and boutique hotels alike. Nationwide scrutiny and safety concerns have loomed large in the wake of the September, 2017, attack at the Mandalay Bay Resort and Casino in Las Vegas. In response, hotel owners — across America, and here in Cleveland, OH — are rethinking their approach to hotel security. While some hotels have kept pace with evolving threats, others are discovering that their security systems and practices are stuck in the past. This process has led to important questions. How should hotels in Cleveland respond to consumers’ safety concerns? Which threats are the biggest risks to the city’s hospitality sector? Where are outdated practices leaving local hotels vulnerable to modern threats? Hotels in Cleveland need answers to these question if they’re going to protect their guests with proper hotel security and safeguard their reputations against modern threats. Here’s how they can find them. Smarter hotel security in Cleveland starts with smarter security vendors. Some local security companies have stuck by traditional practices. They rely on paper-and-pen reporting, deliver a boots-on-the-ground presence, and cookie-cutter security plans. Other vendors have modernized their practices, harnessing innovation to deliver a more affordable, responsive, and effective service model. They use digital systems for faster response and real-time reports. They reduce costs and amplify reach through the use of roving patrols and dedicated personnel. And they customize their approach based on each individual client’s needs. Training, workforce practices, and personnel oversight. Physical access to data centers and data access points. Security, oversight, and visibility to site access points. Impact of security practices and security presence on guest experience. Performance and cost-effectiveness of current security practices. Innovation opportunities for site security. If a full-scale assessment seems like a big leap, you may wish to start by consulting local security vendors. At Signal 88 of West Cleveland, our experts offer no-obligation consultations on hotel security throughout West Cleveland. We also offer consultations to hotels, motels, resorts, and other hospitality providers in Lakewood, Euclid, Cleveland Heights, and Strongsville. 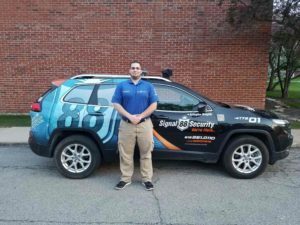 Call Signal 88 of West Cleveland at (216) 544-9800 today to request a hotel security consultation.